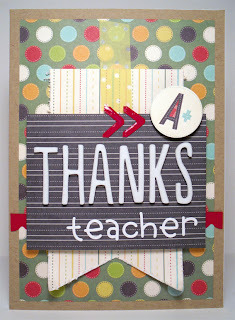 Education and schooling has been a hot topic in the Canterbury region this past week so I thought I'd make a card to say thanks for all the hard work our wonderful teachers do at all levels. I love the way it's turned out. Bright and colourful with some texture, dimension and a hint of gloss using Glossy Accents on the little hand-cut arrow details. I used some Thickers from the Amy Tangerine range to say 'THANKS'. I love how the letters aren't perfect so they have a handwritten effect - perfect for this sort of card! 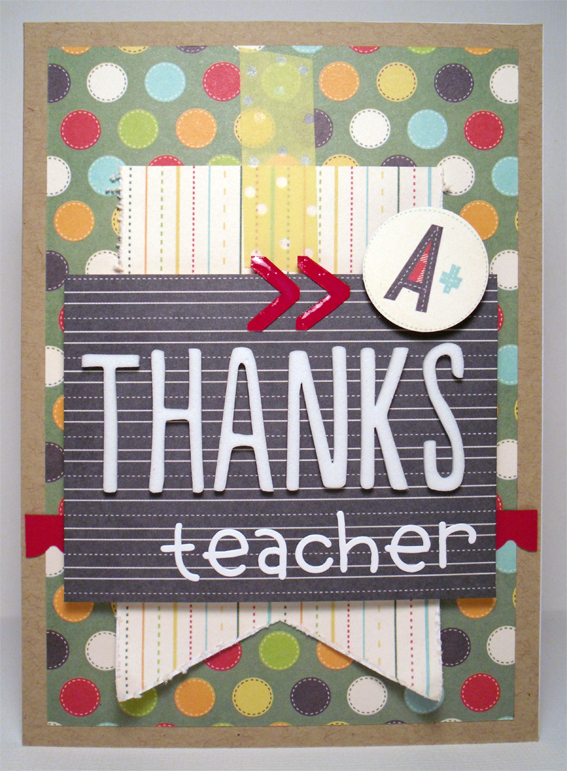 I used Doodlebug Design Inc Teensy Type to say 'teacher'. I love these alphas too. So darn cute and a fantastic price. 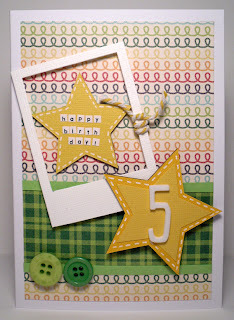 My second card is a 5th birthday card. I've used green and yellow as my 2 main colours which I think can suit both a boy and a girl. I made a polaroid to frame 'Happy birthday!' and I left a space on the polaroid to include the name of the birthday boy or girl. The stars are from FabScraps and I just covered them with cardstock to give them some quick colour. This card also has a lot of dimension as all of my cards do! I don't think I've ever made a flat card. I just love how the dimensional stickers just give that instant pop. Thanks for stopping by. Don't forget to check out the Scrappin' Online store for these goodies and so much more including some gorgeous new product from Teresa Collins, Prima, Bo Bunny and more! Products used: My Mind's Eye School Daze Paper Pad, FabScraps Chipboard Stars, Doodlebug Design Inc. Teensy Type Alphas White, Amy Tangerine Journal Thickers White, Glossy Accents.